All politicians have their own catchphrases, slogans and manifestos. These tell us who they and what they stand for. Perhaps, just perhaps, Jesus is somewhat similar. When he stood up in synagogue, he proclaimed for all to hear, “I have come to bring the Good News to Poor”. Jesus could not be any more direct or clearer. This is why he came. 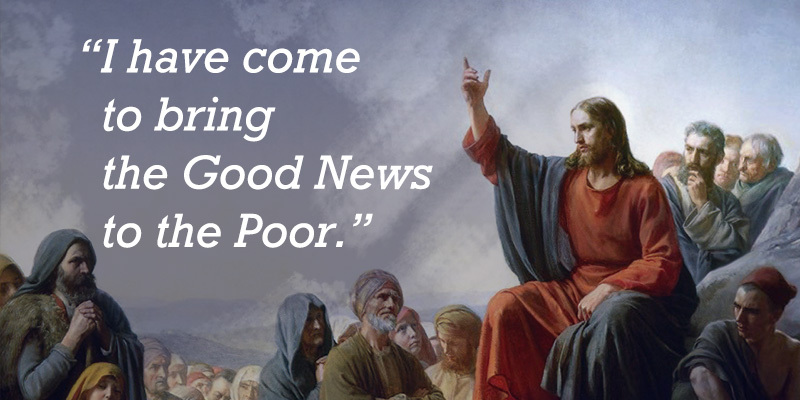 Jesus teases this out a little more in today’s gospel as announces and proclaims The Beatitudes. Although Luke uses the word ‘Happy,’ a better translation would be to say ‘Blessed.’ At the time of Jesus it was the wealthy, the powerful and the religious leaders, the Scribes and the Pharisees who saw themselves as being blessed by God. They thought of themselves a being better and holier than everyone else. They looked down on those who were poor, sick, widowed or orphaned. In they eyes of the rich and powerful, how could God love them or be interested in them. How could they be blessed or happy in anyway? The message of the world, modern society and the world of advertisements tell us that our worth and dignity come from spending, buying and owning more and more things. This might be a new car, the latest phone or the most fashionable clothes! There is absolutely nothing wrong in working and earning a just and decent wage to care for ourselves and our families. But are we more interested in a life style or a quality of life for ourselves and our families? Today’s gospel offers us some of Jesus’ teaching that more than likely made him enemies. His preaching favoured those who were the poor, the sick and the marginalised. He overturned not only the social norms of his own time, but of our time too. Jesus, rather than simply tell the poor to be happy with their lot in life and accept it, also offers a challenge and warning to those who see themselves as powerful, mighty and wealthy. In the end it will be these powerful and threatened people who will put Jesus to death because he challenged and disturbed them. It will be the poor, the outsider and the persecuted who will follow him. Where do we find ourselves today? In the four beatitudes of being blessed or the four woes being asked to consider how we are living our lives according to Jesus and the values of God’s Kingdom? He then came down with them and stopped at a piece of level ground where there was a large gathering of his disciples, with a great crowd of people from all parts of Judaea and Jerusalem and the coastal region of Tyre and Sidon. How blessed are you who are poor: the kingdom of God is yours. Blessed are you who are hungry now: you shall have your fill. Blessed are you who are weeping now: you shall laugh. Blessed are you when people hate you, drive you out, abuse you, denounce your name as criminal, on account of the Son of man. Rejoice when that day comes and dance for joy, look!-your reward will be great in heaven. This was the way their ancestors treated the prophets. But alas for you who are rich: you are having your consolation now. Alas for you who have plenty to eat now: you shall go hungry. Alas for you who are laughing now: you shall mourn and weep. Alas for you when everyone speaks well of you! This was the way their ancestors treated the false prophets.